That one fairy tale every little girl will never forget. That one story that touches our soul and feels hopeful about everything. And that one fairy tale that every Filipino can relate to. 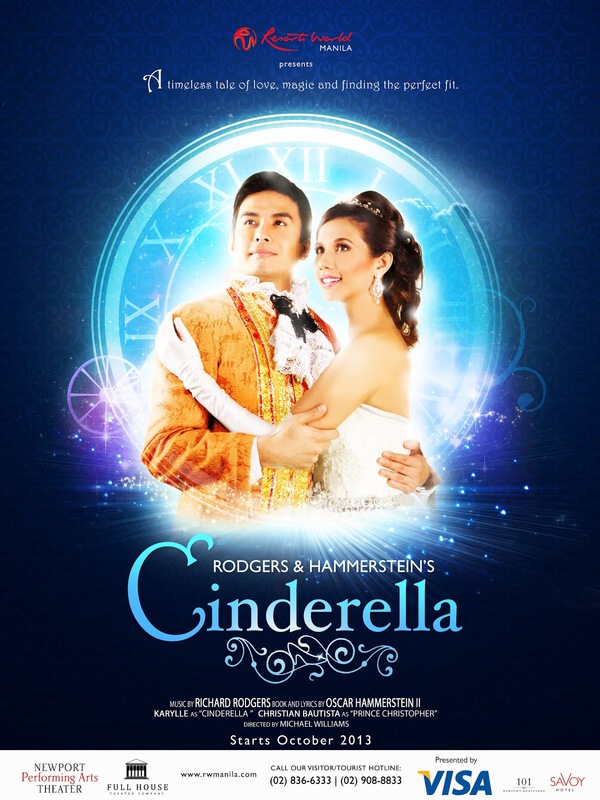 This coming October 2013, get ready as the Resorts World Manila shares another beloved Rodgers and Hammerstein musical slated to capture the hearts of kids and adults alike through the wonderful story of time with Cinderella. The grand and magical stage of the Newport Performing Arts Theater (NPAT) will soon be the new venue for Disney Princess Cinderella as Resorts World Manila offers the the timeless magical story of this young girl who met his Prince Charming after leaving her beautiful glass shoes behind the castle where he rules. 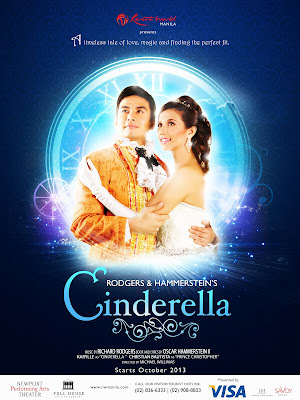 Starring our very own Christian Bautista as Prince Christopher and Karylle Tatlonghari as the humble, sweet and beautiful Cinderella, RWM will takes us to this magical story this coming Holiday 2013 along with the splendid music that captivated of the heart of the many all over the world. It was back in 2008, when the Tony Award winning actress Lea Salonga top-billed Broadway Asia Entertainment’s 30-week Asian tour of Cinderella, which premiered in Manila. And this 2013, under the direction of veteran theater actor and director Michael Williams, Cinderella will also feature Julia Abueva and Justine Peña as alternates for Cinderella, while Fred Lo will be the alternate for Prince Christopher. Playing the roles of the three challenging characters of stepmother and the two step sisters, The Company's Sweet Plantado will lead the plank along with Maronne Cruz and Gianina Ocampo as the two crazy and funny stepsisters. The first lady of Philippine musical theater, Menchu Lauchengco-Yulo, will also once again step into the enchanted stage of the NPAT playing the role of the ever-reliable Fairy Godmother, her alternate Pinky Marquez will also doing some jobs as the wicked stepmother in other runs of the show. While Sheila Francisco and Miguel Faustmann will play as the Queen Mother and King Father, together with Red Concepcion, who takes the part of the Right Hand of the King. Cinderella was originally written for television by Rodgers and Hammerstein, which was based on the popular French version Cendrillion by Charles Perrault. The television musical was first broadcasted in 1957 in CBS which was viewed by over 107 million people during its network premiere. With Julie Andrews as Cinderella and Jon Cypher as the Prince, this three-act TV version was comprised of original compositions that spiced up the well-loved fairy tale including "In My Own Little Corner", "Ten Minutes Ago", and "Do I Love You Because You’re Beautiful." Several remakes were made including the CBS 1965 version starring Lesley Ann Warren as Cinderella and Stuart Damon as Prince Charming. Walt Disney also made their own version in 1997 which featured a star-studded cast which includes Brandy, Whitney Houston, Paolo Montalban, Bernadette Peters, and Whoopi Goldberg among others. Following the success of Kaos, Sound of Music and The King and I, Resorts World Manila's Cinderella is definitely another must-see and must-experience theatrical play that every Filipino should catch this time around here in the one-stop, non-stop entertainment and tourism destination in the country. And in RWM Chief Entertainment Officer Colin Kerr's term - "more bonggacious", their version of Cinderella is made to brings us back in time with the little princes and princesses fantasy of ours with their lavish LED back draft, and amazing and fitting costumes and stage design. Cinderella will start slipping off her magical glass shoes starting this October 9, and will be on every Thursday (8pm), Friday (4pm and 8pm), Saturday (3pm and 7pm) and Sunday (3pm and 7pm). The tickets for this show are priced at Php 2,800 for the VIP Section, Php 2,500 for the Premiere Section, Php 2,000 for the Deluxe Section, Php 1,300 for the Balcony Section and Php 1,100 for the Lower Balcony Section. For other ticket inquiries and reservations, you can visit www.rwmanila.com or call Tourist Hotline at (02) 908-8833. Let's all have a magical Holiday Season once again with Resorts World Manila's Cinderella! I know you'll love to see what they have to offer here!